Is there a class to suit me? The classes are intended to allow anyone with a wish to learn or re-learn Irish. There are classes at three levels plus a Monday conversation circle. There is one class for absolute beginners, typically Australians who have never learnt Irish. Another class for people who may have learnt Irish at school in Ireland but want to brush up on the language, including the grammar. And a third for people who are fairly confident speakers but who want to extend their skills in the language. Our conversation group also meets on Monday evenings. It is informal and relaxed and can vary from four to ten participants. Although not everybody has quite the same command of the language, everyone is willing to have a go and this adds interest and spontaneity. Topics are not pre-arranged and range from news and current affairs to the personal and general chit chat. We constantly aim to increase our vocabulary range as well as to extend the other language skills with the overall aim of improving fluency. Classes are on Monday nights 6 to 8 pm, at the Gaelic Club, 64 Devonshire Street, Surry Hills, near Central railway station. What did the beginners think? 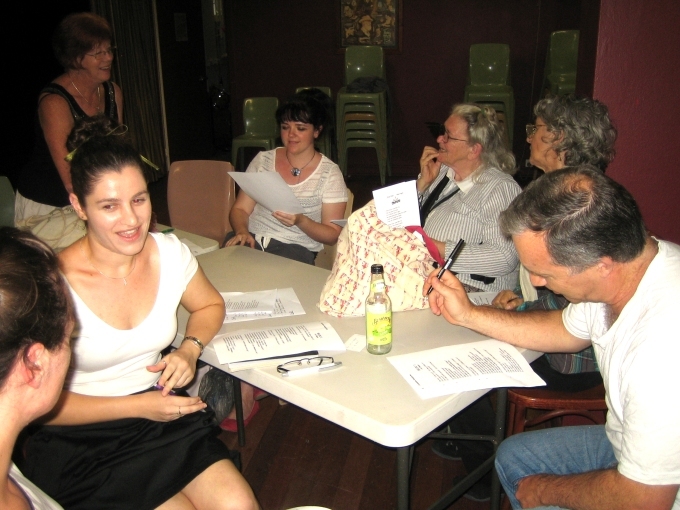 Did you enjoy speaking Irish in classes at the Gaelic Club on Monday nights? F: Yes very much so, the students from the different levels are patient with us and always helpful. M: I've enjoyed an rang (the class) in the short time I've been. I enjoyed an chéad Luan den mhí nuair a labhraímid le cainteoirí líofa (the first Monday of the month when we talk with fluent speakers) - very taxing for the brain but very worthwhile. Was it worthwhile attending the classes? F: Yes it was worth committing to the weekly classes, this gave me a good grounding in basic Irish. Now when I meet the young newly arrived Irish persons and they speak i nGaeilge at least I can reply and carry out a little conversation. M: I think it has a good mix of conversation and ag foghlaim gramadaí (learning grammar). F: As regards the teaching it was very good/fun and always to my level of learning. M: I didn't really expect anything when I first joined! The information was good & the organisation of it week by week was also good. Local teachers are volunteers. However we offer young Irish people who are in Australia on working holidays the chance to be guest teachers. We offer them a small honorarium. Are classes held throughout the year? From the first Monday in February, to the second Monday in December inclusive, Except there are no classes on any public holiday. The first lesson is free. Then you can pay either by the night $6 (or $3 for concession card holders) or by the term $40 (or $20 concession). A term is 10 weeks. Are there any classes for children? We do not have classes designed for children. However children over about 12 years of age with a parent or guardian are welcome. Do I need to buy a text book or pay for anything else? The teachers may recommend a book to you. I have another question who do I ask? Please contact us through the Contacts page.